Supplementary material reads: "Rogers and Cowan. Cr. 5-4581. To Los Angeles Examiner. 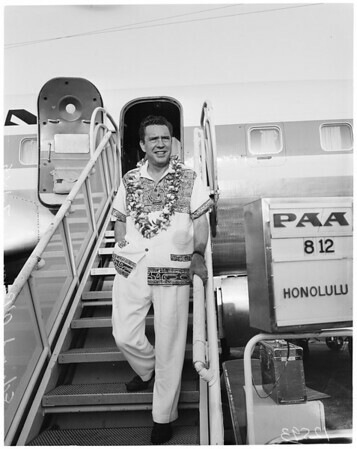 Trans-Oceanic Commuter... Actor Edmond O'Brien is seen arriving from Japan at International Airport this morning (July 1) for half-day filming, returning to the Orient tonight to finish role in MGM's 'The Last Voyage.' Actor asserted trans-oceanic commuting will be commonplace in near future with step-up in jet air travel".